Ask fellow campers about "Turner Falls Park" and nearby attractions. Stayed for two nights at the designated RV campground. End of March the occupancy was low (4-6 other campers). 50A hookup with water. No sewer. Site had picnic table, charcoal grill and campfire ring. Overall, clean area. 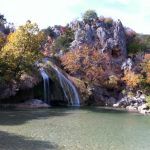 Its located on "level-2" of the park so to get to Turner Falls, one needs to walk down a fairly steep hill, on the main road (about 15 minutes walk to falls from campground). Adjacent to this campground is the main restrooms for all campers so it can be quite busy at times. We camped at Turner Falls Park in a Motorhome. The park is a must see. From the falls the water cascades down through the entire park. The paths you walk on and the roads you drive on has water going across. Please call ahead to make sure the park isn't closed due to flooding. You can swim in the falls but not under them. The cascades empty into Blue Hole which has a diving board and slide. Water is everywhere and it's breathtaking. The path to the waterfall is ADA accessible but everything else you'll need to traverse across slippery rocks, uneven ground, or water. The park has 2 castles along the path going towards the falls and you must climb many stairs to reach them. Many hiking trails. Davis Police have a heavy presence in the park. Lots of trashcans but we witnessed folks tossing stuff on the ground. Trash was pretty much everywhere. Not really an issue due to lack of upkeep but inconsiderate guests. No one under the age of 13 years old is permitted to even put a toe in the water without a Coastguard Certified Lifevest. The police strictly enforce this safety measure and you can expect a ticket. As for the campground itself our site was clean and quiet. Sites are sold by first come first serve. We had water and electricity hookups with a dump station nearby and dumpsters too. Sites are not numbered. The grass was really tall at our campsite and our camper trailer was longer than all of the RV pads. No shade trees so you get full full sun during all daylight hours. Arbuckle Fried Pies and Smokin Joe's is just down the road from the park and I recommend both. 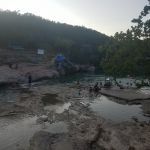 We camped at Turner Falls Park in a Travel Trailer. Everything closes at 7 p.m near the park. You must go into town for gas or food after 7 p.m. The falls and the activities are cool but it was appalling to see how trashy people are and the fact that the park allows it. What a potentially beautiful part of nature only to be trashed by people leaving beer cans, dirty diapers and just trash all over..very disappointed in the care of the park. 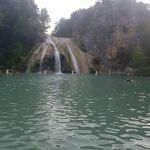 We camped at Turner Falls Park in a Motorhome. The falls of course and the trails and the zip line is awesome..fun activities for the kids just overlook trash. People, please quit being so trashy and lazy pick up your garbage and dispose of it appropriately. Good level spots. Just a few hundred yards from a trail. We were the only RV here which was surprising but nice. Got strong Verizon signal. Picnic table and fire ring at each site. We camped at Turner Falls Park in a Motorhome. This is a great park that we had been to before, but the location of the RV sites is "off the beaten path" and is a hike to anything fun like the falls or swimming area unless you want to go rock climbing. Not family friendly from that aspect. We left after about 4 hrs. I will go back to Turner Falls, but not in an RV. We camped at Turner Falls Park in a Motorhome. The place was crowded, but the staff was very friendly. The kids had a blast. We camped at Turner Falls Park in a Campground Cabin. This park is operated by the city of Davis Oklahoma. We thoroughly enjoyed our stay as we were the only guests on the entire mountain. The park has no sewer hookups but does have a dump station. The restrooms and showers were below our standards but the view and the staff more than made up for it. We had a great time. If you like the outdoors and all that God has created, you will love this scenic park. There is limited WiFi if you park in front of the office and hop onto their internal router. It's wide open and they allow it, but it's sort of limited too. No chat program make it through their filter and it is only a satellite connection so the latency is pretty bad too. We love this park though. Some of the nicest people you will ever want to meet both on staff and in every store we went to in the adjoining little town. We would definitely stay there again. We camped at Turner Falls Park in a Fifth Wheel. Great but pricey since you must also pay park admission per person plus overnight RV charge. It is beautiful in the park and very convenient but would have rather stayed elsewhere and visited the park. We camped at Turner Falls Park in a Motorhome. 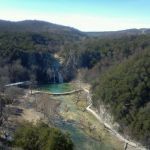 Are you affiliated with Turner Falls Park ?